Well, perhaps you’ve guessed from the title and picture that today’s giveaway has a Scots theme! 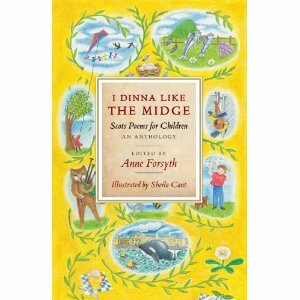 ‘I dinna like the Midge’ (RRP £6.99) is a lovely anthology of Scots poems for children and is ideal to keep on the teacher’s desk, to dip into now and again for your ‘Poem of the Day’. It has lots of old favourites, including The Three Craws (three craws sat upon a wa, sat upon a wa, sat upon a wa-aw-aw-aw!) Aiken Drum, Katie Beardie and Coulter’s Candy. How many of your children know these traditional Scottish songs and rhymes? Hi We have just been doing an art activity today to learn Robin Robin Reidbreist by J K Annand and the children really enjoyed it, also learning a bit about the poet on the Scottish Poetry Library website. My favourite lately is Street Talk – again by J K Annand – great for drawing a cartoon strip to illustrate! 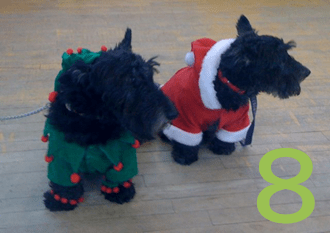 Hi Susan, aww that sounds brilliant – what a super idea and a wonderful way to build in some Scots at Christmas time. Thanks so much for sharing – Street Talk is a new for me – and I love it! Also, thank you too for the reminder of The Scottish Poetry library – what excellent resources there are for teachers! Jeffrey has added your name to the hat for today’s prize draw!